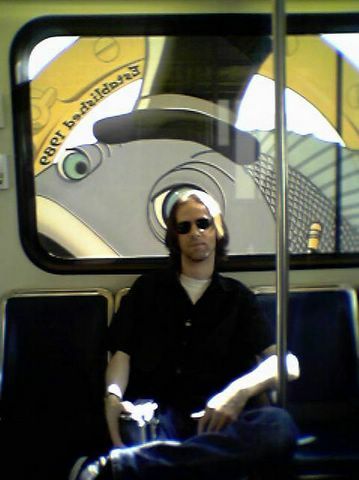 A nifty shot of me on the People Mover with an omnious fish looming over my head. Photo by Gina, camera phone image. The fishie has his eye on you. Perhaps you are not the bait, but the prize. Prize meat to eat, so neat, to make his night complete! I wish to meet a fish so large. I wish to eat a fish so large. Hmmm, interesting. All this talk of fish is making me hungry though. It is a pretty good pic though, I like the whole Eye/fish/head planetary convergence kinda thing going on there.